This graphic novel presents the first comics in which the Smurfs ever appeared! In Medieval times, a court jester named Peeweet who lives in a King’s castle discovers a flute that makes those who listen to it dance until they collapse from exhaustion. 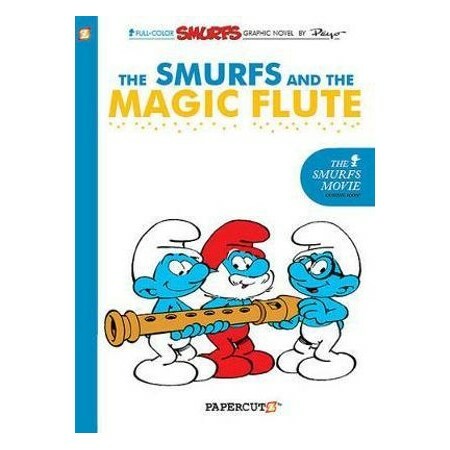 When a thief steals the flute, Peeweet must search out the makers of the flute, the Smurfs, to make an even more powerful flute to combat the thief in this wildly funny tale that introduced the Smurfs to millions. Considered a legend in the comics world, Yvan Delporte was a writer often credited with helping to usher in the "Golden Age" of Franco-Belgian comics. Best known for his work on "Smurfs," Delporte also served as Editor-In-Chief for the comics magazine "Spirou," helping to create the memorable comics character "Gaston Lagaffe." Peyo created The Smurfs in his comic strip "Johan And Peeweet". Peyo wrote over 8 extremely popular titles in Europe throughout his storied career. In 2008 the country of Belgium celebrated what would have been his 80th birthday by issuing a 5 Euro coin featuring his creation, The Smurfs.